Leather Quality is Important - Jofelo leather journals are handmade from Full Grain Leather that will endure the Test of Time. Jofelo leather is durable, yet soft and handcrafted from the highest quality thick Full Grain Leather Made from AMERICAN Cattle. The bindings are leather and not glued. Our vintage journal manufacturing process ensure that your leather bound journal will last a life time and truly become a family heirloom. 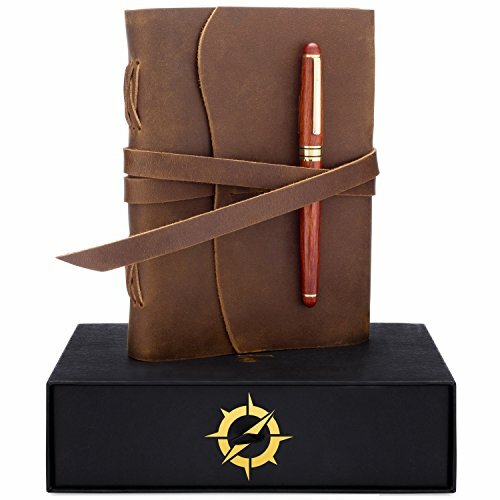 Each refillable leather journal is unique and no two are quite the same. Rosewood Pen - Elegant and perfect for all writers and business professionals. Smooth writing, excellent for signatures, journaling and calligraphy. Made of real rosewood this is a beautiful and wonderfully pen! Refillable – Leather bound notebook and journals with 300 Pages of Quality Thick 5-inch by 7-inch unlined blank paper. Will Not Bleed Through with fountain pens, calligraphy pens, ballpoint pens or roller pens. Limitless Uses: Vintage Journal, Writing journal for men, journal for women, bullet Journal notebook, travel journal, vintage leather, leather notebook, small journal, large journal, leather sketchbook, daily notepad, drawing notebook, art sketchbook, scrapbook, art book, art journal, drawing pad, hunting log, journalist notes, field notes cover, thought book, prayer book, men’s journal, women’s journal, brown Journal, black journal, leather journals for men, leather journals for women, refillable notebook. ✅ Multi-Functional - Use as a refillable leather journal, travelers notebook, blank journal, unlined journal, drawing notebook, vintage journal, portfolio. So many great ways to use a personalized reusable notebook, you truly can't go wrong! If you have any questions about this product by Jofelo, contact us by completing and submitting the form below. If you are looking for a specif part number, please include it with your message.